Most people have by now noticed that Gunung Agung has stopped erupting. And to understand why that has happened, and what will happen soon, we need to look at what happened during the eruption. We also need to look at what is currently happening. When a volcano is showing no visible signs of activity, we have to turn to instrumentation to understand what is going on where we can’t see anything. But, before that, we must look at what a volcano is at its most fundamental level. Tempel covered in ash. Photograph by Tangkaswara TP. Most people tend to think of volcanoes as outlets of magma, but the magma is just a way of transporting energy. In mantle plume volcanoes this energy has travelled from the bowels of Earth, at spread centre volcanoes the energy is transferred from the mantle, and in subduction volcanoes that energy is caused mainly by friction from the subducting slab grinding against the thicker upper crustal part. Now, many will say that it is lava that is squirting out. Well, yes it is lava that is squirting out, but the greatest difference between lava and your average garden rock is heat. And heat is a form of energy. So, any volcano will be a basic energy transfer system. But, the magma type does have effects of how the volcano will erupt. The energy transfer affects when, size and type of eruption in combination with the type of magma involved and the involved volatiles residing in the magma. These combinations are affecting the behaviour of every single volcano on the planet. Sometimes two close by volcanoes erupt in completely different patterns and ways due to this. Current tremor chart. Image from Badan Geologi. Agung is a subduction volcano of a fairly ordinary type. At depth magma accumulates at a point called the accretion zone, it is where melted subducted rock pools complete with its molecular components and energy in the form of heat. This pool of magma will take on characteristics of the subducting plate. If it is water rich the magma will be water rich, if it is rich in metals and sulphuric compounds the ensuing magma will also be that. Due to the heat the melt will weigh less than the rock above, so it will be buoyant and try to migrate upwards like a hot-air balloon. Heavy volcanic tremor episode. Image from Badan Geologi. In the end that balloon of hot magma will enter the magma chamber of Gunung Agung and it will start to expand, both from the heat increase and the volume of the fresh magma. There will also be considerable exsolution of volatiles as the magma nears the top of the magmatic system. In the case of Agung the magma is rich in silicates, water and sulphur. The magma at Agung is of a highly silicic type called andesite. That means that the magma is sticky and prone to being able to contain substantial amounts of water and gas before fracturing. That makes it potentially very explosive as it comes out. What has happened at Agung? Before any visible signs happened at Agung, scientists started to pick up small earthquakes and see a slight inflation of the volcano indicating that new magma was entering the system. In this case they knew that Agung was reactivating about a year prior to the current activity. This made it possible to increase the monitoring and start to produce more detailed evacuation maps. At the same time local authorities started to consult with the scientists to prepare for what would potentially come. As activity increased over time these plans became more detailed and the local population was informed about evacuation plans. As things progressed even further an exclusion zone was put into place and people where evacuated from the mountain. After that the volcano started doing what volcanoes do best, and that is erupting. The opening stage was a hydrothermally driven phreatic detonation that lasted for a short while. After that the volcano returned to a more restful look. Sulphur cloud caused by Gunung Agung. Image by JPL/NASA. A phreatic detonation is when increased heat from below rapidly heats water inside the mountain causing steam explosions. This often clears out an upper conduit through the mountain that the magma can follow at a later stage. During this interlude the seismic signals and inflation continued and increased until the mountain finally erupted by ejecting fine grained tephra and prodigious amounts of sulphurous gases. This eruption phase has been calculated to have been a small VEI-3 with 0.012km3 of ejecta. Here comes what is rather unusual. A second vent opened up after a couple of days, and pure steam came gushing out next to the vent ejecting the tephra. This can be seen on the video above. Normally all water has been boiled off from a volcanic system prior to the magmatic phase, but here there must have been a rather powerful aquifer or water body next to the volcano that took to long time to heat up to an explosive level. In the end the shear volume of water quenched the andesite in the conduit and a glassy plug formed that corked up the eruption completely. This is among other things measurable on sulphur gas output that has diminished quite a lot from during the eruption phase. Daily life near a volcano. School children going to school outside the exclusion zone. After the eruption there have been almost daily episodes of violent tremor caused by ever more increasing pressure inside the volcano. This pressure is caused by the energy in the form of heat causing the old magma in the system to expand further as it heats up, and it is also caused by more magma entering the system. This tremor has been very large compared to other similar systems, so we do know that the rate of pressure increase is high. There has been a lot of volcanic type earthquakes also, and that is another sign of increasing pressure. Evacuation being enforced by the Indonesian authorities. Photograph by Humas Basarna. The shear intensity and duration of the tremor episodes tell a story that it is in the long run impossible for the quenched plug to hold back the lava. It also tells that the plug is very solid and sitting very firmly in the barrel of Agung. This is potentially bad news. Either the plug will start to slide up and form a dome or a spine before being blown away. Or, the plug is so firm that it will shatter inside the conduit and come out explosively during an explosive phase. And the general rule is that the longer time we must wait, the larger the ensuing eruption will be. Currently the seismic signals have quietened down, this is normal prior to an eruptive phase. But, it is also possible that we will see several more phases of intensified seismic unrest prior to the next eruption. If I was to hazard a guess here, it would be that we will see a more intense eruptive phase at any time, ranging from in a few hours to a few weeks. But, my opinion may change as we get more data. One thing I am thankful for is that it is the Indonesian authorities that oversee this. The local scientists and authorities are very good at these things. I would even go so far as to say that they are the best in the field currently. It’s even easier to see the correlation between the bangs on the seismogram and “puffs” from the crater at night. In fact in the last few minutes I’ve seen flashes (presumably small explosions) actually within the crater, followed by the familiar dullish glow from the crater rim… Timed right on top of a big report on the plot. Now, A clear steady glow from the Agung crater. Purely speculation, but if the quakes are shallow (ie failures in the plug) and “IF” there is a lava dome in the crater then i’d imagine each jolt would disturb the dome giving rise to puffs and incandescence? Has been a fairly clear day an probably no rain on Agung. Shaking now every 20 minutes or so, each one lasting a minute or two. How do they manage not to overlap? I found this link in the comment section on Jon’s blog, it has a really nice model of oraefajokull without ice, and it also shows it as it could appear if the ice melts completely and is replaced by lakes (which probably will happen late this century/next century/when im really old 🙂 ). Apparently the cauldron is deeper now “by a significant amount”. About 20 metres deeper says IMO. That sounds significant to me. Larger movement at around 23:30 . Apologies meant to put ”longer movement”. You mean South Georgia is (albeit briefly) looking like ‘South Georgia’ ? Where is Ga? Forgive my ignorance please! Georgia, and I think most of Texas got snow, big deal here. The State of Georgia in the United states of America. The deep south and south east of the USA are getting snow (in a narrow bank maybe 100 miles wide) It shows it is snowing from New Orleans Louisiana up to the area of Washington DC. I forget we have an international audience! Might be misreading it, but according to Nexrad, there is snow out in the Gulf south of here. And the professional weather guessers are saying light snow here after midnight. And the cam watchers are rewarded with a bit of verification from Darwin’s Observation. This works out to 1.08 m³/s DRE rate. That’s ash from Sinabung then? Not Agung right? Sinabung is on ADVISORY NR: 2017/586 at FL160… and now Darwin no longer has an active advisory out on Agung. Definitely some incandescence at the summit now. Two vents at the moment one dark ash one brighter. Coincides at the same time with large movement on the seismogram. Well, one thing is answered: they have some sort of lowlight or IR setting for the tower cam at night. At 5:30 local (as I was watching it) it switched to a normal setting. Quite a noticeable difference. Its nearly as wide as the whole of the top crater. This is the best cam right now. I’m Chrome casting it while I go about the daily routine in the house. Nice to see it on the big screen. Wide without much altitude. Some white steam mixed in so I’m thinking still lots of H2O involved. Okay… this question has been moved out here from the back channel. Could ringwoodite be the cause of frequent subduction eruptions? Ringwoodite, a high pressure phase of Forsterite, is known to contain copious amounts of water in it’s crystal lattice. It is postulated to occur in the mantle at depths down to about 660km. Does ringwoodite undergo dehydration melt at 670 km? The reason that I ask, is that in ultra steep subduction zone settings, this could be an alternate source of magma for some of the more prolific erupters. At Pinatubo, the slab dangles almost vertically under the over riding crust. This would place the 110 km traditional dehydration zone magma source almost directly over the 670 km depth contour. I have no idea if the sunda trench has a similar geometry, but if it does, that could account for the high number of usually active volcanoes in Indonesia. All opinions welcome. Especially if you are a rock scientist. I thought, it can be volcano bombs. None of that seismograph bodes well. Deep and shallower rock-fracturing quakes with fluid codas, some drumming and pulses. There’s hot magma on the rise. Even though I am no expert, I doubt it will be long before this whole lot blows. I’m sure the local experts are on the ball, so I wish them luck. Note: This is effectively just a dart toss. Energy influx rate into the system and rock resiliency will have a greater determining factor towards what actually happens. another pop at 07:50 local. A plume just started erupting right now.. When the cam shakes is that the wind or the mountain shaking with a quake ? The plume does not look very wind blown at all. It is not the mountain: the camera seems to be shaky. I think the structure the camera is mounted on sways when people walk on it. Am I seeing things or is something a bit different about the right-central crater rim? Hey look! An accurate article on Yellowstone! And it looks like the miners are back today, albeit starting an hour later than usual. Are we starting to see some pyroclastic activity on the right side of the crater (as seen from Cam 1)? The side of the cone looks grayer and it looks like the dome may be rising above the crater rim. Or it just might be the angle of the sun. I saw that also Joe, hard to tell. 4,1 at Bardabunga to start the weekend. Has it prompted any doom-sayers yet? Just my dogs. They don’t notice the snow, but they don’t linger outside before wanting back in. Not volcano-related, but I’m in eastern Virginia and no snow yet (though it’s 38° and we’ve had two inches of rain). 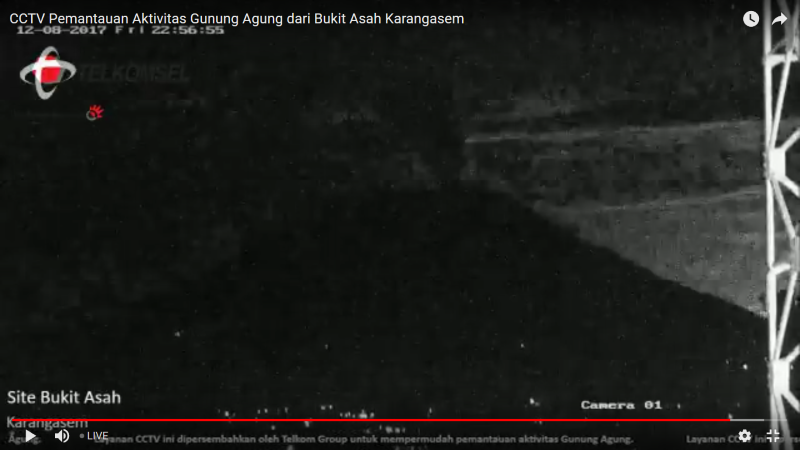 A quick check on comparing the video of Agung with the seismograph shows that the ash explosions occur 2 minutes after the quake. That seems a tad unlikely, and a second check reveals that the time on the camera is indeed off by 2 minutes. 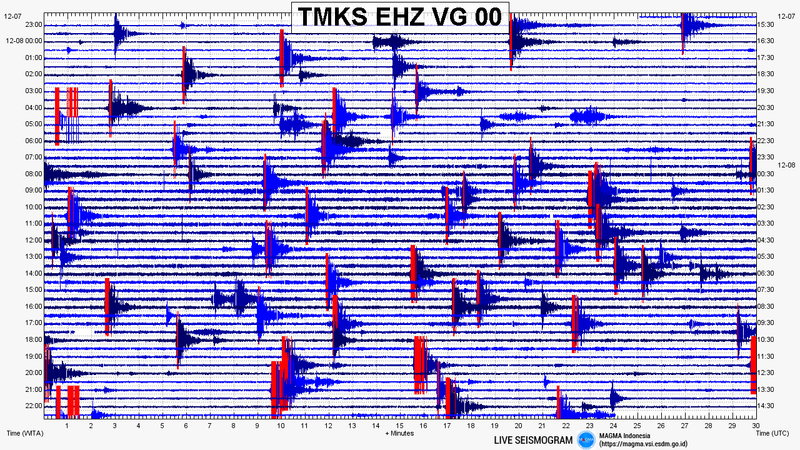 So some of the signals recorded by the seismograph are the summit explosions, presumably phreatic. It was either yesterday (UK morning) or 24 hours before that,just after Bali dusk, that I witnessed a couple of bright flashes within the crater, followed a very short while later by rising plume. At that point, the times seemed spot on when compared to the seismogram, so I suspect that the setting went wrong when they got the cams back up and running. Glimpse between clouds now of the Agung peak with only small steam emission visible. Meanwhile a 4+ at Bardabunga. I guess it is continued adjustments of the plugg. Has anyone else noticed that these little events seem progressively less ashy and more steam? Is it shifting to a slightly different phase now? Instead of those short lived events, the plume has been constant now for around 90 minutes. Is this a sign that the dome has broken up? I’m not seeing any major spikes on the seismogram. Darker plume now aswell but don’t know if this is because of the camera ? And here we have the first photo of the lava dome at Gunung Agung, made by some volcano spotter who seems not to care too much about his life.. They compare the lava dome to the one of Ibu at Halmahera, a “pancake-dome”. I wonder if the crater fills up before everything goes boom. Due to the interaction with the big amounts of water I’d be surprised if the volcano is able to push the solidified plug much further. The longer it takes to blow it up, the bigger the eruption will be. It seems to be at a point of no return and an eruption is quite likely to happen. It could however take several weeks/months until something happens though. That surely has to be a photo taken to some extent by a drone! A death wish is one thing but checking out via a pyroclastic flow……. Not absolutely sure this could be called a ‘dome’ in the strict sense (AFAIK Agung doesn’t have a history of dome building) Rather, it seems to be that lava,, viscous but not excessively so, has been more or less passively filling the crater – and this could continue until either there’s structural failure of the crater wall, or lava overflows to generate a flow down the outer flank (as happened in 1963) In either event, the sudden removal of a large volume of de-gassed lava might well trigger a lively response from the volatile-charged magma below In a word, BOOM! I tried to fit to found image of the crater before an eruption for estimate how much is needed to fill. That LOOKS like a good match . If it is even remotely accurate, the crater has filled remarkably quickly, and we will soon be witnessing lava leaving the crater. Imagine a slow long lasting effusive event right next to the “golden circle”. That would be something for the tourists. Largest quake since 1992 according to this interview/article. 40 quakes swarm and 3 stars at Skaldbreiđ already. The VC interactive map isn’t online anymore? It got taken offline during the edge debugging. It’ll be back soon. Update on Gunung Agung, Hekla, Skjaldbreidur Seismic Swarm and Öraefajökull! Nice ashy blast out of Agung just now. Still lots of water involved. Gunung Agung is approx 3031m above sea level at present. You see the figure 3142m on a few sites – presumably the pre-1963 height. What are people’s thoughts with regard to the idea that another big eruption could take it down to below 3000m? The main blast may take it below 3000m but the effusive follow through may take it higher.